After Security Council Secretary Nikolai Patrushev delivered the letter from Russian President Vladimir Putin to his American counterpart Barack Obama, experts from both countries make guesses about prospect of U.S.-Russia cooperation in missile defense, security, anti-terror campaigns and the settlement of the Syrian crisis. This week Security Council Secretary Nikolai Patrushev handed over a letter from President Vladimir Putin to U.S. President Barack Obama in Washington, DC, the press service of the Russian Embassy to the United States said. The letter is a response to Obama’s message that U.S. National Security Adviser Tom Donilon brought to Moscow on April 15. Both letters concern bilateral relations. 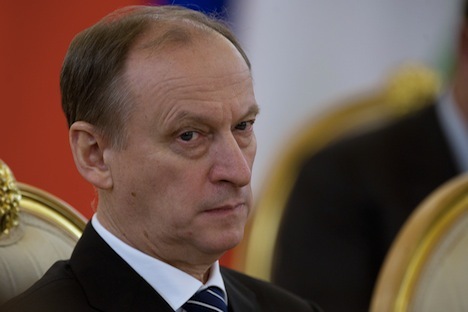 Patrushev had been visiting the U.S. since May 20, Vedomosti reported. Obama briefly joined his meeting with Donilon on May 22. The U.S. President reaffirmed his desire to strengthen the bilateral relationship, National Security Council Spokesperson Caitlin Hayden said later. They also discussed the importance of deepening counterterrorism cooperation and the need for a negotiated political settlement in Syria. According to Business Standard, Patrushev also met with Defense Secretary Chuck Hagel. They discussed a range of issues including missile defense, increasing military to military cooperation, and the ongoing crisis in Syria, Pentagon Press Secretary George Little said. Meanwhile, in his letter to Putin Obama proposed deepening cooperation on missile defense, for example by exchanging data in this area. The Russian letter also concerned missile defenses and Russia’s vision for how they could work in Europe. “We are not completely satisfied with the American proposals”, State Duma Foreign Relations Committee Chairman Alexei Pushkov said. “Essentially, we have been invited to establish a missile defense information exchange service. But we can get information on American novelties from other sources. Moscow needs legal guarantees that the American missile defense system won’t be targeting Russia, or a treaty on joint development of a missile defense system”. According to him, Moscow’s position is that the development of the American missile defense system is creating an imbalance. “The Preamble to the New START says the treaty shouldn’t impose any limits on the American missile defense system. So we have been invited to reduce our strategic offensive arms, while the U.S. will be developing new means to neutralize whatever Russia still has remaining after the reductions”, Pushkov said. Congress Republicans have opposed Obama’s initiative too, albeit for different reasons. They have been trying to block the President’s proposals on cooperation with Russia by sponsoring a bill banning the disclosure of any details of the American missile defense system to the Russians, especially the so-called hit-to-kill missile interception technology by direct hits. “The administration is actively discussing the declassification of our life-saving missile defense technology”, Republican Alabama Congressman Mo Brooks who has introduced the legislation said at a hearing. The Pentagon has denied any intention to supply Russia with classified information, maintaining that there had only been a discussion on capabilities of current missiles and the speed of their fuel burnout, Izvestia reported. “The mutual missile defense information disclosure agreement needs a two-third majority to clear the Senate, meaning that some Republican votes are needed too because Democrat votes won’t be enough”, Deputy Director of the Europe and International Studies Center at the Higher School of Economics Dmitry Suslov said. Russia and the United States have the best-developed missile defense systems at present. Both nations have tactical and strategic missile defense capabilities. The U.S. has been actively deploying its missile defenses in various regions of the world in recent years, including near Russian borders, causing Moscow’s indignation. The article is a combined report based on reporting by Vedomosti and Izvestia.